The Hmong, are a minority ethnic group that live primarily in China and Southeast Asia. Between 300,000 to 600,000 Hmong live in Southeast Asian countries, such as Vietnam, Laos, Thailand, and Myanmar. Another approximately 8 million Hmong live in the southern provinces of China. Since the end of the Vietnam War in 1975, Hmong refugees from Southeast Asia have settled in Australia, France, Canada, and the United States. 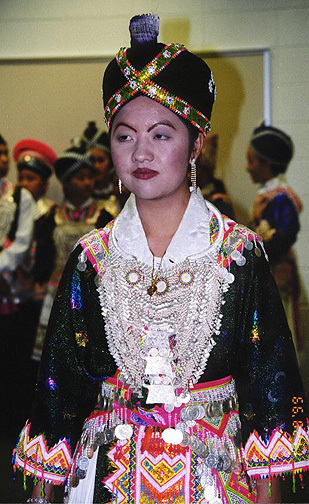 The United States has the largest Hmong refugee community, with a population of more than 110,000. The word Hmong, which means "man" in the Hmong language, is the name used by the Hmong people themselves. The Hmong are known in China as Miao and in Southeast Asia as Meo. Many Hmong dislike these terms, which they translate to mean "barbarian." During the Vietnam War, some Hmong began translating the name Hmong as "free man" to express their desire for political independence. Hmong in all parts of the world share a common tonal language. Each spoken syllable has a pitch, similar to a musical note, which indicates the meaning of the word. The Hmong language contains seven tones. In written form, the last letter of a word is not pronounced, but indicates the tone. For example, the syllable mi can be pronounced in different tones to produce a variety of words, such as mib (sweet), mij (noodle), mis (woman’s breast), and miv (cat). European and American missionaries developed a written form of the Hmong language in the mid-1900s. Many variations of the Hmong language have developed in widely separated local communities. Within Hmong society, subgroups speak slightly different versions of the Hmong language. The largest subgroups are White Hmong, Red Hmong, Blue or Green Hmong, and Striped Hmong. A traditional Hmong story tells how these subgroups originated from a strategy devised by a Chinese emperor to divide the Hmong people. 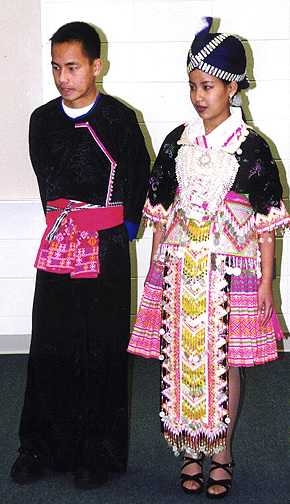 The emperor ordered Hmong villages to adopt different styles of dress, hoping that over time they would begin to think of themselves as different peoples. 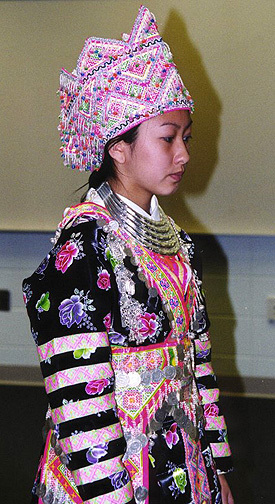 Although the Hmong never lost their shared cultural identity, subgroups did develop small differences in language and in customs, such as weddings and funeral ceremonies. Today the women of each subgroup wear distinctive traditional clothing. White Hmong women wear plain, white skirts. The skirts of Blue or Green Hmong women are highly decorated with needlework. Striped Hmong women wear shirts with blue and black stripes encircling their long sleeves. Differences in men’s clothing are less notable. 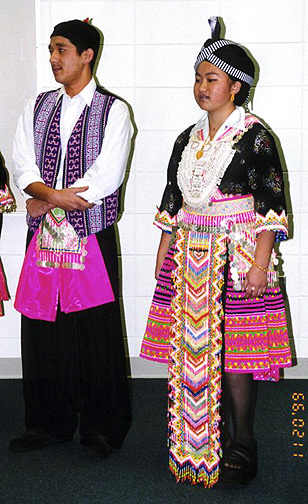 The traditional Hmong men’s costume consists of a black tunic and black wide-legged trousers. 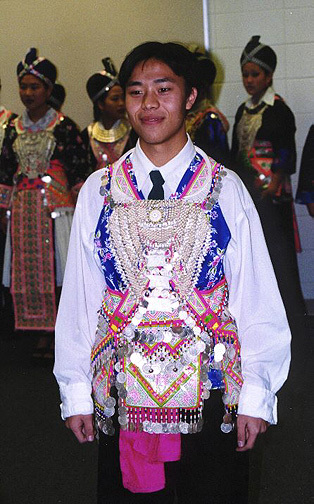 However, many Hmong men have now adopted Western clothing styles. Prior to the 20th century, Asian Hmong women made most of the clothing for their families from hemp. They made their own dyes from vegetables and other plants and learned numerous needlework techniques to create paj ntaub (flower cloth). Clans, which consist of extended family members, also play an important role in Hmong society. 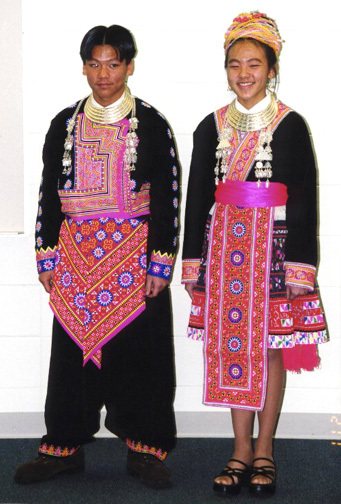 Hmong custom forbids members of the same clan from marrying each other. A Hmong bride joins the clan of her husband. Marriage is seen as the union of two families, and clan leaders usually negotiate marriage contracts between the families. Hmong spiritual beliefs combine ancestor worship and animism, the belief that all things have spirits. Hmong women decorate clothes with embroidered symbols and patterns to attract friendly spirits and ward off unfriendly ones. Shamans serve as spiritual advisors and healers. They erect altars in homes and place shrines in fields and along trails. Shamans also perform ceremonies and prescribe remedies for some illnesses, which are thought to be caused by evil spirits. In the early 1900s, Christian missionaries began visiting Hmong villages throughout China and Southeast Asia. Although they studied Hmong culture and developed the written form of the Hmong language, these missionaries made few converts. However, since the Vietnam War, a substantial number of Hmong living in refugee camps and the United States have converted to Christianity. In China and Southeast Asia, Hmong practice swidden agriculture, a farming method that involves cutting and burning a forested area to clear fields for crops. Hmong farmers plant rice, corn, cucumbers, melons, yams, eggplant, onions, beans, sugarcane, and various herbs and spices. Men and boys hunt to bring in extra food. Village blacksmiths make all the necessary tools. Most scholars believe the Hmong migrated to southeastern China from central Asia approximately 5000 years ago. In the early 1800s, thousands of Hmong left China and settled high in the mountains of Vietnam, Laos, Myanmar (Burma), and Thailand. In 1893 many of these Hmong settlements were incorporated into French Indochina, a French colony encompassing Vietnam, Laos, and Cambodia. With French encouragement, many Hmong turned to opium cultivation during World War II (1939-1945). When Japan invaded French Indochina in 1940, Hmong militias, under the leadership of Toby Ly Foung, aided the French. After the Japanese surrender in 1945, the Viet Minh, a Vietnamese nationalist group, resisted the restoration of French rule in Vietnam. Some Hmong sided with the French and others joined the nationalist forces. On May 8, 1954, the Viet Minh overwhelmed the French army in the Battle of Dien Bien Phu. Following the French defeat, negotiations held in Geneva, Switzerland, resulted in the division of Vietnam into northern and southern zones. The United States gradually entered the conflict as allies of the new South Vietnamese government. In North Vietnam, the Viet Minh set up a Communist regime and attempted to reunify the country. As the Vietnam War erupted and spread into neighboring Laos, agents of the U.S. Central Intelligence Agency (CIA) recruited Hmong to fight against the Communists. Under the leadership of Vang Pao, a Hmong officer in the Lao military, the Hmong waged guerrilla warfare against the Communists in Laos and Vietnam from 1961 to 1975. Hmong soldiers monitored and attacked enemy supply lines, rescued downed American pilots, and ambushed Communist soldiers. They also guarded radar installations in northern Laos used to guide American bombers over Laos and North Vietnam. At the war’s peak, Vang Pao commanded a force of nearly 30,000 men. The whole operation remained secret because it violated an agreement guaranteeing the neutrality of Laos that was signed by the United States and 13 other countries in 1961. In 1975 the United States withdrew its forces from all of Southeast Asia. Hundreds of thousands of Hmong, fearing revenge from the victorious Communist governments of Vietnam and Laos, fled to Thailand. There, Hmong families crowded into crude refugee camps, often without adequate supplies of food and water. Although the United Nations (UN) and international relief agencies brought supplies and services to the camps, many refugees died from disease in the first few years. 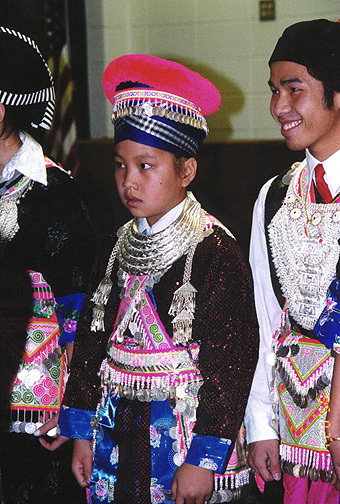 Between 1975 and 1994, more than 110,000 Hmong refugees resettled in the United States. Churches, nonprofit agencies, and families in at least 32 states sponsored refugees. Sponsors oriented the Hmong to their new communities, helped them to find homes, and provided financial assistance. The U.S. Department of State tried to spread the refugees out across the country to minimize the impact on any one region. However, once within the United States, Hmong families relocated to reunite their families and clans. 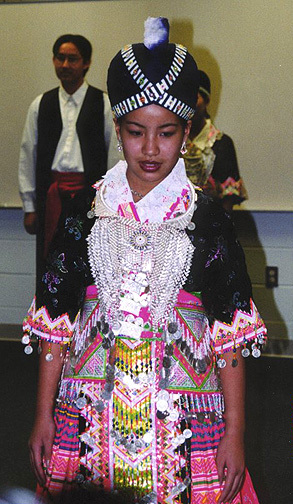 The largest Hmong-American populations now reside in California, Minnesota, and Wisconsin. Because Hmong tend to have large families, these communities have grown rapidly. Hmong families have faced considerable challenges in adapting to American life. Lack of English language fluency, education, and job skills have forced many to rely on public assistance. Some have successfully started small businesses, such as grocery stores and restaurants. Hmong women have earned money selling their colorful needlework. Many young Hmong-Americans, raised in the United States, have enjoyed greater success in the job market than their immigrant parents. Like other immigrant groups, the Hmong have formed self-help associations in their communities. Lao Family Community, Inc. and Hmong Mutual Assistance Associations help new arrivals make the transition to American life. They offer translation and interpretation services, language and cultural orientation classes, food pantries, and housing and employment programs. These organizations also serve as community centers, offering opportunities for the surrounding non-Hmong population to learn about the Hmong. They offer frequent workshops and sponsor annual New Year festivals that are open to the general public.